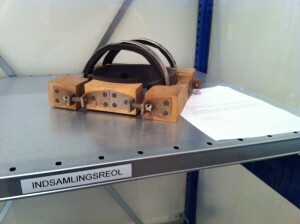 This post by Thomas Söderqvist has first been published on Medical Museion. Thanks to Thomas for the crossposting. The planning for The Psychiatry Room began half a year ago when we realised we had to move the library, and that the best place to put the books was — right, the psychiatry gallery. Good for the books but bad for the psychiatry exhibit, which was only six years old. We didn’t want to remove psychiatry from the museum altogether, however. Mental illness is a hot topic and our visitors love the history of psychiatry. We also had the ambition do some museological experiments. For example, we have been talking about open storage — to make much larger parts of our collections accessible for visitors — for almost a decade now. And I, for one, have long been toying with the idea of creating an acquisition room as a way of showing how medical heritage is created and inspire visitors to bring in stuff. 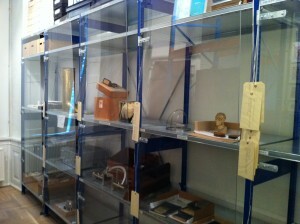 First, it is an open storage room, where you can see all the objects and images in our collections relating to psychiatry, including some archival records from the Danish psychiatry. 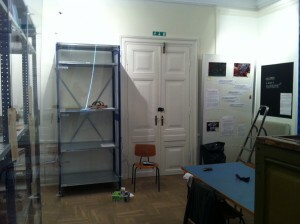 Second, it is an acquisition room, where we will exhibit all newly collected artefacts from today’s psychiatry. We are starting out with a single storage rack, because we don’t expect a flood of artefacts to begin with — but as we acquire more things, we may have to add another rack (and hopefully a whole new room …). Third, we see it as an inspiration room, where researchers, students , museum curator and members of the public are invited to come and look at objects and images and get inspiration to ideas for research, teaching assignments, exhibitions, art works, etc. It can also be used as a seminar room, where students, psychiatric staff, officers and members of patient associations, etc. can meet over lunch or a cup of coffee and discuss the past, present and future state of psychiatry — with the stored artefacts and images as a backdrop. The meeting table in the room is placed close to a wall that is dedicated to possible future directions of psychiatry. 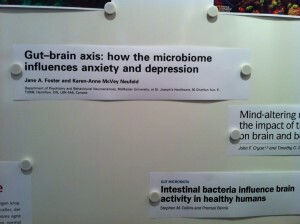 In the next of couple of months we will use the white boards to ask questions about the newly discovered association of mental disorders with the gut microbiome. Can this exciting basic research findings be turned into new future psychiatric treatment methods? The people behind the room are senior curator Niels Christian Vilstrup-Møller (curator) together with student assistants Mads Stender and Anders Stein Knudsen; conservator Nanna Gerdes (conservation work, Twitter documentation); web curator Daniel Noesgaard (metabolism wall); assistant professor Adam Bencard (metabolism wall); cand.mag. Peter Meedom (research); cand.mag.stud. Astrid Mo (web); and myself (idea and conceptual development).